A Nottingham based online food retailer has secured an undisclosed sum from private investors to grow its business in the UK and Europe. 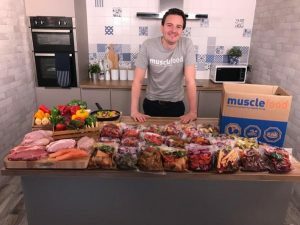 Grocery disruptor Musclefood.com has secured the investment from BGF to expand its core offering in the UK and continue its European expansion. The investment comes after the company, valued at £50m, sought backing to surpass its growth expectations and continue to make inroads into the UK supermarkets. The retailer has already secured listings in Sainsbury’s, Spar and Co-op with talks underway with other major food retailers. It’s also in more than 300 Musgrave-owned stores in Ireland. The company has recently successfully launched in the Netherlands, Germany and France with plans to grow across Austria, Spain, Poland, Ireland and Italy during 2018. Other countries it will be targeting include Portugal, Denmark, Sweden, Bulgaria and Switzerland. MuscleFood.com launched in 2013 and over four years has surpassed £100m turnover, selling 53,000 healthy items each day to customers ranging from fitness fans to money conscious families looking for quality and affordability. It’s carved out a unique retail niche selling a mix of high protein foods, lean meats, a healthy range of ready meals and popular foods including its Protein Pizza which is stocked in Sainsbury’s. Its innovative Protein Pizza sold almost a quarter of a million units in its first year, making the company the fifth biggest UK pizza retail brand in the UK. The brand has become very closely associated with healthy eating with many of the UK’s highest profile sports stars, Olympians and even celebrity chefs such as Lorraine Pascale becoming customers thanks to the high quality of the fresh produce sold. Its rapid growth makes Muscle Food one of the UK’s fastest growing SMEs and has attracted the attentions of brands such as Heineken and Knorr who are eager to market their products to Muscle Food’s customers. Investor BGF was set up in 2011 and since then has invested around £1.3 billion in 200 small and medium sized companies.Among them are gym chain Xercise4Less, the fast-growing recipe kit company Gousto, and Trunki, the ride on suitcases. MuscleFood.com founder Darren Beale said: “This marks a big step forward in the progression of the company and the brand. It gives us the ability to expand faster and further than we could have done without the cash injection and to invest in concepts we believe could bring us a good return. “We’re a team who passionately care about one thing; making it easier for our tribe of customers to achieve their fitness and health goals. “And this is what really excites me and the team about this partnership with BGF. It will help us accelerate our growth and that means more people will realise it doesn’t have to be expensive or difficult to live healthy everyday – with MuscleFood it is easy. “The expertise we’re gaining from BGF will help us get in front of important contacts and open doors for us both on the UK high street and further afield.